Soil typically does not have enough nutrients to support seed germination or grass growth. Apply the right fertilizer and work it into the soil just before planting grass seed to add nutrients to the soil and prevent burning up grass seed. Proper fertilizer application will help you achieve an even spread of grass growth. Fertilizer contains three primary nutrients: Nitrogen, phosphorous and potassium. You can tell what percentage of nutrients is in your fertilizer by looking at the NPK number on the label of your chosen fertilizer. Nitrogen promotes growth and color. Phosphorous helps grass establish strong root systems and fight fungal diseases. Potassium aids in photosynthesis. Soil uses all of these nutrients quickly. Gardeners must provide these nutrients in order for grass to get everything it needs to spread across the lawn. Starter fertilizer is the type of fertilizer gardeners apply when seeding. This fertilizer type is high in phosphorous to help grass seedlings develop strong root systems. Use 20 pounds of fertilizer with a NPK amount of 5-10-5 over 1,000 square feet, 10 pounds of fertilizer with a NPK amount of 10-20-10 over 1,000 square feet or 6 pounds of fertilizer with a NPK amount of 16-20-0 over 1,000 square feet, according to the University of California. Work the fertilizer into the soil before distributing grass seed. Pour half of the fertilizer amount needed for your lawn into a rotary spreader. Push the spreader back and forth horizontally over the lawn. 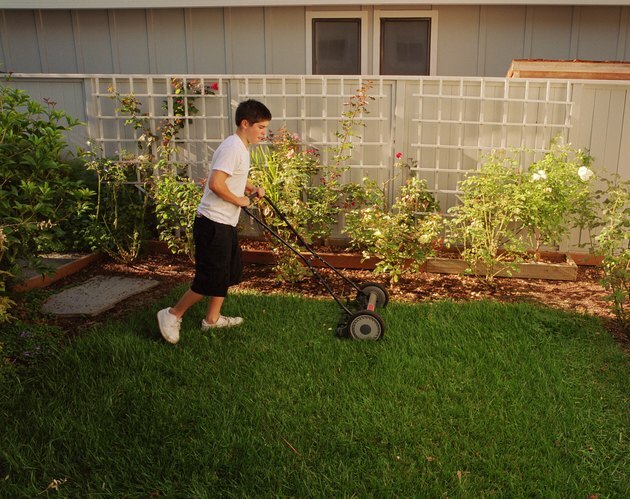 Apply the rest of the fertilizer needed vertically across the lawn to get an even spread. Till the fertilizer into the first 2 to 4 inches of top soil. 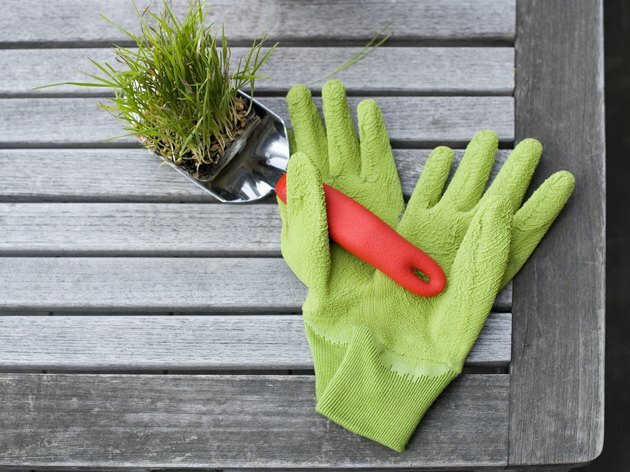 Use a rake to smooth the soil's surface and water the lawn to activate the fertilizer. Seed your lawn immediately after applying the fertilizer. 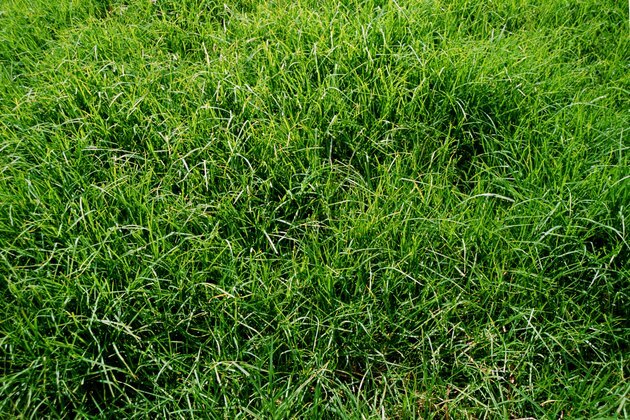 If you wait to seed your lawn, weeds will take advantage of the nutrients and start popping up in the bare yard. 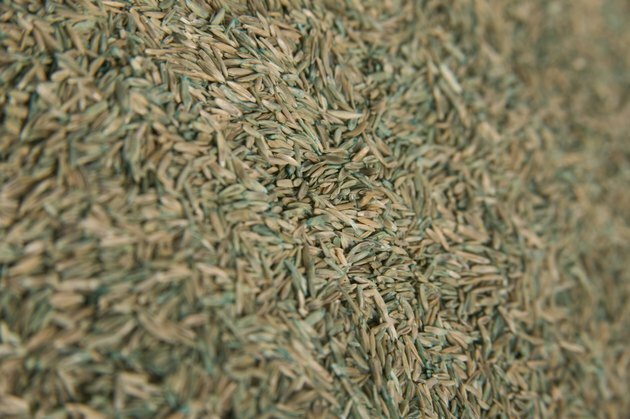 You basically seed the lawn exactly how you distributed the fertilizer: Divide the amount of grass seed in half and applying one half vertically, then the other half horizontally. The amount of grass seed you use depends on the type of grass you are growing. 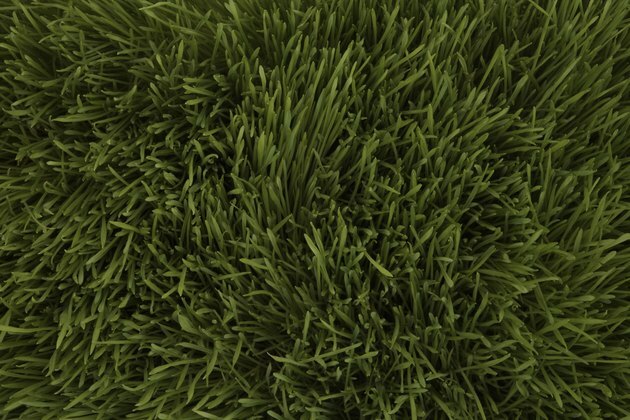 For example, Bermuda grass should be distributed at a rate of one pound per 1,000 square feet. Cover your seed with 1/8 of an inch of compost and water.